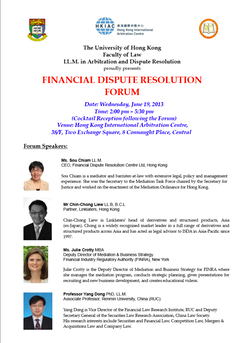 Our Hong Kong face, Sala Sihombing (Adjunct Associate Professor, HKU) was delighted to be able to chair the panel discussion at the Financial Dispute Resolution Forum held 19 June 2013 at the HKIAC. The forum was co-sponsored by the University of Hong Kong Faculty of Law LLM in Arbitration and Dispute Resolution and the HKIAC. The panel featured a distinguished group of practitioners and academics including Ms Sou Chiam, (CEO FDRC), Ms Julie Crotty (Deputy Director of Mediaiton and Business Strategy, FINRA), Mr Chin-Chong Liew (Partner, Linklaters and P.R.I.M.E. Finance Expert) and Professor Yang Dong (Associate Professor, Renmin University). 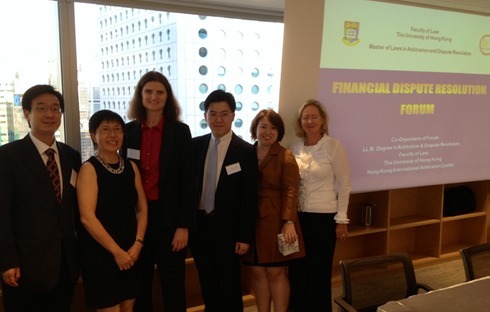 Professor Katherine Lynch (Director, LLM ADR HKU) gave the welcome address and had structured and organised the forum. The forum was very well attended and participants were treated to a lively discussion about the currennt state and future potential of financial dispute resolution. From left to right, Professor Yang Dong, Ms Sou Chiam, Ms Julie Crotty, Mr Michael Wong, our face Sala and Professor Katherine Lynch.